I was in LA for the ESSENCE Black Women in Hollywood event, and overbooked my trip to give me time to drive up the Pacific Coast Highway, which I heard had epic views (all true.) Hearst Castle was my third stop (more posts on that later). I have a thing for house museums, particularly those of the upper crust during the Gilded Age (1890s- 19-teens). More of less, the owners were titans of industry (transportation, steel, publishing) and amassed vast wealth very quickly. They were considered "new money" of their day for their lavish spending on what was considered tacky for the time. Go figure. More than anything, they spent on their houses and the decor, often collecting artifacts from around the world. (Walking into one of these near-100 year old estates isn't just a walk back in American history, but World history.) They wanted visitors to know they had long money. And the art, design, decor, engineering, technology were the best of their day. And when their day was done, they often left their entire estates to the State or a preservation society as a living museum. So quite often, you get to see the house as it was lived in. Entering these homes is like stepping into a DeLorean. 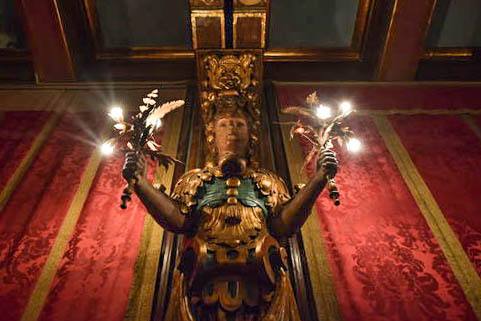 Anytime I've visited one of these home museums, a guide or a fellow tourist inevitably makes a reference to either Hearst Castle or Biltmore, the largest home in America. I crossed Biltmore off the list in January. (It's gigantic, but not nearly as impressive as Hearst.) Hearst, on the other side of the country, took a little linger to get to, but it was sooo worth the journey. The estate belonged to William Hearst, the founder of Hearst publications. He started with newspapers, then delved into magazines. Maybe you've heard of some of them: Cosmo, Esquire, Town & Country? His fortune during his lifetime fluctuated between $250m-$400m, not adjusted for inflation. Easily, he was worth a few billion by modern standards. The backstory is that his family owned the land that Hearst now sits on and used it as a cattle ranch. Hearst grew up there. After his mother died, he began building his dream house with the help of Julia Morgan, California's first licensed female architect. Beginning in 1919, they spent nearly nearly 30 years on the 115 room mansion and guest houses. The main house was unfinished at his death (and now). So onto the castle. This is the view from the drive up from the visitor's center. To give you a sense of the land, it's about a 15 minute ride from the parking lot to the castle, which sits on about 85,000 acres now. In its heyday, the acreage was 350k. Hearst was married, but he lived in the castle, his vacation home, with his much younger girlfriend, an actress, while his wife and kids lived on the East Coast. When Hearst died, he left 51 percent of his estate to his girlfriend, who actually gave it back to the family. She had her own money from Hollywood and never liked the perception that she was with Hearst for his money. I mean, she admitted it started that way, but in the end, it was love. Our first stop on the tour was here (below), which looks like the main entrance, but isn't. That big structure in the background isn't even the main house. LOL. This (below) is the structure in the background in the picture above. It's one of the many cottages Heart built for his guests. The tour guide noted that this isn't even the biggest cottage. Ha! I included a couple detail shots just you could see, well, the details. No expense was spared here, or anywhere else on the estate. THIS is the house!!! If you look closely, you can see that the front and the back are two different colors. Again, that's because after nearly 30 years of building, the house was never finished. It reminded me of the Catholic churches I saw in Brazil. And that's intentional. He wanted a house that looked like a cathedral. This is part of the side of the house, and the entrance we used to enter for the first floor tour. I loved this statue. Chick is chilling so hard. LOL. It's a pretty suggestive statue, one that might not line up with a house that looks like a church. Notably, Hearst wasn't all that religious. He considered himself Christian, but didn't claim any specific denomination. Let's start in the living room. The castle is heavy on antiques. Hearst was a huge collector, beginning in childhood. He has the literal fortune right at the end of World War I when Europe was financially devastated and works of Art were being sold far below market value. There was also no regulation on what could be sold out of the country. Most of this stuff couldn't cross the border today. 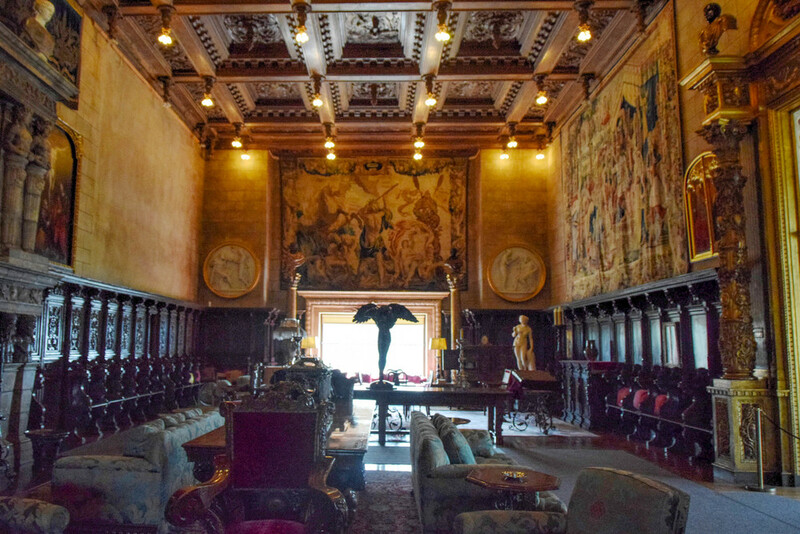 The dining room, which shows just how seriously Hearst took the castle motif and indicates his fondness for entertaining. The game room. I've seen a lot of super big houses. I've noticed that folks who like to pack a room often run out of stuff to pack it with, so they buy two of everything, even if it's redundant. There was a similar room at Biltmore (which didn't allow pictures inside). Hearst's girlfriend was a movie star, and lots of his friends were Hollywood big shots. It only makes sense that he would have a movie theater, right? This was the end of the first floor tour, so we had to rush out. Otherwise I would have tried to get a better shot, and a shot from the front of the room, so you could see the number of seats. There were at least 50. I had some down time before my next tour, which included the private bedrooms. I wandered around the estate checking out the views to kill time. And I found the other cottages that the guide mentioned at the beginning of the tour. I kinda wished I had taken that tour too. Maybe next time. Husband said he wants to come here, so I guess that means I'll be back! Mr. Hearst's bedroom. I had to lighten the shot of the ceiling for you to see the details. Sorry, it's a little blurry. Hope you can make it out though. It was so grand. 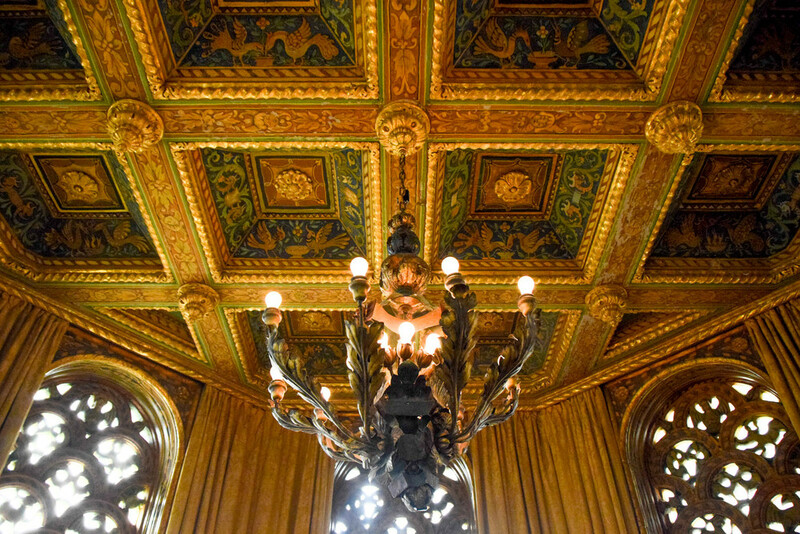 Hearst had a special "thing" for antique ceilings, and he reserved the best for his bedroom. The girlfriend's bedroom. She stayed here unless the Mrs. was in town, at which point she moved to a beach house. Like Mr. Hearst's room, it was pretty small for the time period. The bedrooms for the houses in Newport are probably triple this size, even if the houses are significantly smaller (and the Newport families, which included a couple Vanderbilts, had more money than Hearst). Hearst created a pair of special bedrooms and drawing rooms for his VIP guests, the so-called "Celestial bedrooms", all gold rooms that were situated on the fourth floor and just under the bell towers at the front of the home. The play of light off the colors of the room was just gorgeous. This is where I would have wanted to stay if I was invited over. LOL. Don't know if Hearst had Black friends, but he did donate heavily to HBCUs, including Fisk University. Unfortunately, the outdoor swimming pool has been under repair for about two years, so it was drained during my tour. The caretakers used to refill it daily, despite the leak, but the city of San Simeon, where the castle is located, is experiencing a drought, so... no water. It's still gorgeous. Another view of the pool, facing the castle and cottages this time. I've seen a lot of houses, and a lot of grandeur. This is the most beautiful room of them all. My jaw dropped when I walked into the pool house. It's just... marvelous. If I recall correctly, the guide said there were 3 million tiles used to create this room. No matter which tour you select, the pool house is the last stop on the tour. It's a bittersweet goodbye. The reflections in the pool were just beautiful. A really good photographer could probably capture this so you can't tell which side is up or down. I will get there someday. LOL.